Cathay Pacific is shaking up its Asia Miles loyalty program with a sweeping overhaul of how points are both earned and redeemed. Virtually every traveller on Cathay Pacific and its regional arm Cathay Dragon will be affected by the changes, which kick in from June 22, 2018. The shake-up follows a wide-ranging recast of Cathay Pacific’s companion Marco Polo Club frequent flyer scheme in early 2016 and brings the two programs closer together in areas such as dividing routes into six ‘zoned’ categories from ultra-short to ultra-long. Earning Asia Miles will no longer be a strict multiple of how many miles you've flown, but rather based on a mix of three factors. The new earnings chart takes into account not just the travel class but the specific type of fare you've booked – for example, popular business class tickets in the D and I categories will earn less points than the more expensive J and C business class buckets. As you'd expect, all the way from economy through to business class, cheaper tickets will earn fewer points. The upshot: savvy travellers who want to maximise their points will have to be very specific about which particular fare class they're booking into. Another element in the earnings equation: 'distance zones' which generally mirror the current Marco Polo earnings chart. The Ultra-short category includes the likes of Taipei and Manila. Short routes include Singapore, Shanghai, Bangkok and Tokyo. Dubai and Cairns belong to the Medium set, with most Australian cities falling into the Medium-long stretch. The Long bracket includes London, Paris, Johannesburg, Los Angeles and Vancouver, while New York, Boston and Chicago all qualify for an Ultra-long earn. This table shows the number of Asia Miles earned across each of the 19 fare classes over a range of destinations in the six distance zones. Cathay Pacific's marketing line is that passengers will "earn more miles on 80% of Cathay Pacific and Cathay Dragon tickets". There's a strong skew towards boosting the points haul on shorter regional flights and cheaper economy fares, although you'll also come out ahead if you book into the right ticket category on most other flights. It doesn't matter if you are a newly-minted MPC Green or a much-travelled MPC Diamond – you'll earn the same number of Asia Miles according to the fare class/distance zone table. By comparison, the loyalty programs of Oneworld partners such as Qantas Frequent Flyer and British Airways Executive Club award a solid serve of extra points to top-tier frequent flyers. 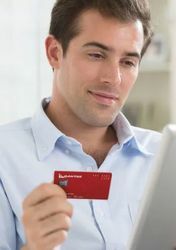 In the case of Qantas there's a 75% points bonus for Gold members (equivalent to MPC Gold) and a double-your-points 100% bonus for Platinum members (equivalent to MPC Diamond). This is a glaring gap in the attractiveness of the Marco Polo Club as a loyalty program. There's also some new maths at play when it comes to turning points into seats, geared around those same distance zones. Economy flight rewards on Cathay Pacific and Cathay Dragon will be pegged at their current rates or come in for fewer points. The biggest winner is the busy Hong Kong-Singapore corridor, where awards drop by one-third – from 30,000 to 20,000 Asia Miles – on a round trip basis. However, some premium economy, business and even first class redemptions will see an increase in the points needed, especially over long routes. For example, a business class return trip between Hong Kong and New York rockets from 145,000 Asia Miles to 170,000 Asia Miles, while a first class return trip to London nudges north from 180,000 Asia Miles to 200,000 Asia Miles. The bad sad news? Asia Miles has ended the quirky discounted rate which saw a return flight redemption priced at less than double that of a one-way flight. Closing this odd loophole means that going there and back now costs exactly twice as much as a one-way journey. 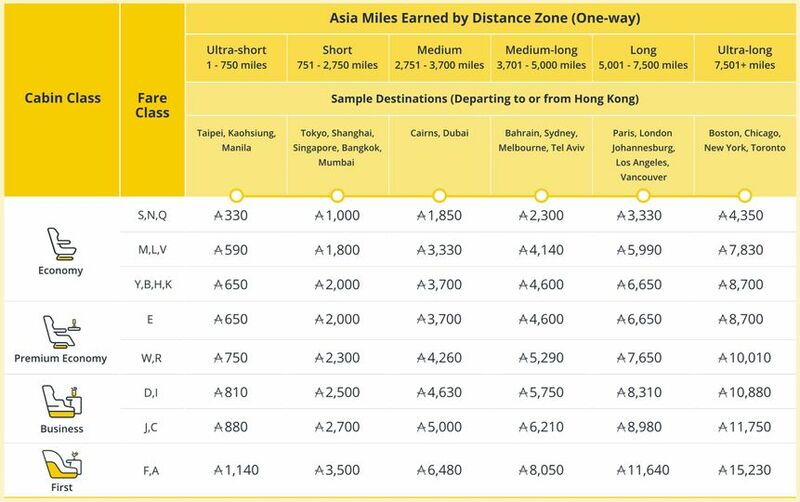 This Asia Miles award redemption chart shows the new one-way rates for a sampling of travel classes and destinations. As with many loyalty programs there are some nuances and 'sweet spots' which become evident as you poke around. In the case of Asia Miles, one of these is Cathay Pacific's popular Sydney-London (via Hong Kong) route. 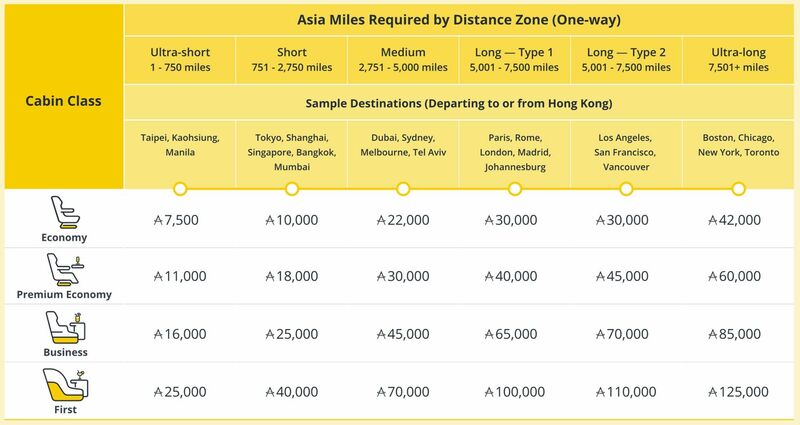 Asia Miles continues to calculate transit awards the same way as before, but the new Ultra-long zone makes for a reduction in the number of miles needed for an award booking. The Sydney-London flight has a total travel distance of 10,554 miles (4581 miles + 5973 miles), so an Asia Miles redemption booking in economy drops from 110,000 miles to 84,000 – although in business class almost the same, going from 175,000 to 170,000 miles. The biggest crowd-pleaser will be greater availability of award seats, with Asia Miles making every seat available on every flight – at a price. There are Standard Award rates as detailed above, with Asia Miles promising an increase of 20% of seats set aside for Standard Awards (averages across all cabin classes and flights on the Cathay Pacific and Cathay Dragon networks). Priority Awards have been replaced by two new categories. There's the Choice Award, which frees up additional seats for a higher redemption rate. By way of example, a Choice Award economy return flight to Japan will cost 30,000 Asia Miles compared to 20,000 Asia Miles for the same trip booked as a Standard Award – so it wouldn't be out of line to expect at least a 50% bump between Standard and Choice redemptions. After that, the Tailored Award category opens up any seat in any cabin on any flight, although the number of Asia Miles needed will be in line with commercial fares – so the scarcer the seat, the more points you'll have to pony up. If you're sitting on a mountain of Asia Miles, Tailored Award bookings are pretty much tailor-made for you. We've hand-picked some popular Cathay Pacific routes across different 'distance zones' to illustrate how the changes to Asia Miles will map out. Hong Kong to Singapore: any business class return ticket currently nets you 3,980 Asia Miles. From June 22 this increases to 5,000 miles on the less-expensive D and I-grade fares, or 5,400 miles on a costlier J or C-class fare. A return business class award ticket today costs 50,000 Asia Miles, and there's no change to that in the new system, although a Choice Award seat will set you back 80,000 Asia Miles. Hong Kong to Sydney, Melbourne or Brisbane: fly business class return today and you'll pocket 11,480 Asia Miles but you won't notice a huge difference after June 22, with D/I fares ticking up to 11,500 miles and J/C fares at 12,420 miles. Using your Asia Miles to book a return business class Standard Award ticket goes from 80,000 miles to 90,000 miles, with the more plentiful Choice Award seats soaring to 141,000 miles. Hong Kong to London: the Asia Miles haul for business class return now stands at 14,958 miles, and from June 22 increases to 16.620 miles (D, I class) and 17.960 miles (J, C class). Today a business class award seat on the route costs 120,000 miles – the revamped scheme increases that to 130,000 miles as a Standard Award and 195,000 miles as a Choice Award. Hong Kong to New York: before June 22 you can expect to pick up 20,148 Asia Miles on a return business class trip; after that, it's 21,760 to 23,500 depending on your ticket class. The ask for an award seat surges from today's 145,000 miles to 170,000 miles if you can snare one of the handful of Standard Award seats, and 255,000 miles if you have to settle for a Choice Award booking. Using Asia Miles to upgrade your paid booking is going to be significantly more expensive after June 22. 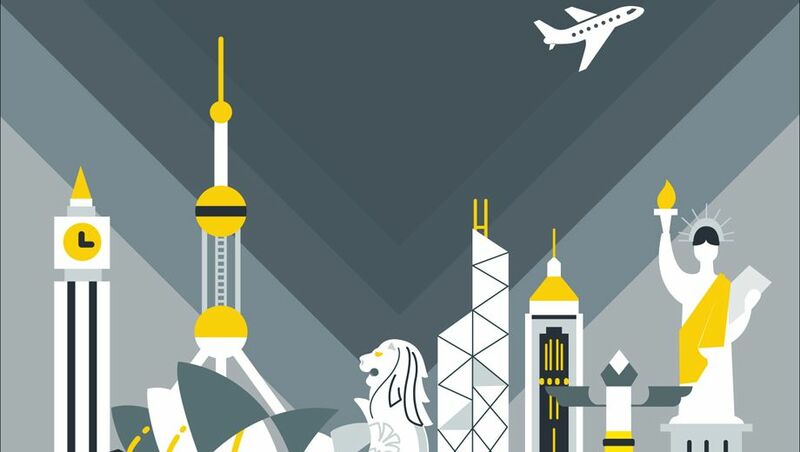 A one-way upgrade from premium economy to business class on a Hong Kong-Sydney or Hong Kong-Melbourne flight will increase from 12,500 miles to 18,000 miles, while a return upgrade on those same routes sees a hefty 60% increase from 22,500 miles to 36,000 Asia Miles. We haven't yet seen the redemption chart for Asia Miles partner airlines – this won't be revealed until June 22 – but some examples sighted by Australian Business Traveller indicate that partner awards will cost some 20% more than an equivalent redemption on Cathay Pacific. Points-based bookings across several Oneworld partner airlines are also going to increase by around 10% under the new zone-based chart. For example, the cost of a 30,000 mile multi-sector award lifts from 190,000 to 210,000 Asia Miles. And if you've been using Asia Miles for upgrades on British Airways or American Airlines, that stops as of June 22 – Cathay's loyalty currency will be useful only for booking seats outright, not for bumping up from one cabin to the next. The new Asia Miles earn-and-burn playbook takes effect from June 22, so if you’re looking to redeem your points on a trip that’ll cost more under the revised rules – including those now-nicely-discounted return flights – you'll want to move fast and make your booking in the next few weeks to avoid the hike. Cathay Pacific has confirmed to Australian Business Traveller that award bookings made before June 22 will fall under the current Asia Miles redemption chart. If your Cathay Pacific or Cathay Dragon ticket is issued before June 22 but you're flying on or after June 22, the airline says you will receive the higher number of the Asia Miles when comparing the pre- and post-change earning rates. This is a smart move to ensure nobody loses out during that interim period. To take a deeper dive into the new Asia Miles pointscape, click through to AsiaMiles.com/change. Stephen lives in Hong Kong, travels across Asia-Pacific for work and around the world for pleasure. When not photographing food and coffee, he enjoys finding rooftop bars and hunting down the best banh mi. Wow, count me as a loser in this change. I go MEL-HKG in premium economy and upgrade to business. I earn 4% more Asiamiles but the upgrade costs 60% more Asiamiles. CX are determined to push their front end loyalists to the opposition . These changes are a slap in the face to those that have supported the airline regardless of the decaying business class product . The additional miles earned on a SYD HKG business class return will be 20 ...( yes 20)!!! !The additional miles required for redemption on the same itinerary will be 10,000. This is the nudge I needed to move my 6 J class flights across to Virgin . Amazing breakdown and analysis by Stephen Chow, if he is a new contributor to AusBT I would like to see more of his work. As for the Asia Miles changes they're not that bad overall, obviously some people win and some lose, but a real shame there is no MPC status bonus which would do a lot to make up for any shortfalls under the new scheme. I agree, what an excellent and thorough breakdown. Well done! These aren't the worst changes we have seen as far as devaluations go (at least on the redemtion side). They seem quite similar to the the SQ award cost increases last year. It would have been nice to have more than 4 weeks notice though. And it's disappointing that the partner and multi award charts were not released together with these changes. Actually, the oneworld multi carrier award chart has been released and you can see it on the asiamiles.com/change site. However there is no full partner award chart unfortunately. Am I reading this correctly... 10,000+ return trips (e.g SYD-LHR, SYD-JFK) on CX should actually come down slightly? If so it's a small win, but a win nonetheless! Yes correct. So business redemptions to London and New York from Australia fall from 175,000 to 170,000 Asia Miles, and economy redemptions are a particular sweet spot here falling from 110,000 to 84,000 Asia Miles. Add the distance of MEL-HKG to HKG-JFK and that is the distance to use to look up the award chart. Stephen , I calculated business redemption as follows SYD HKG SYD as 90000 and HKG LHR HKG as 130000 totaling 220000 miles required ! How do you calculate 170000 ? Asia Miles looks at the sum of the distance of the sectors to your destination when calculating the distance of the award. The distance SYD-HKG is 4,581 miles. Add to that the distance of HKG-LHR of 5,973 and you have a total distance of 10,554 miles (one way). This is what is used to calculate the mileage needed to redeem which is 85,000 Asia Miles on a one-way basis (170,000 return). Stephen,thank you for explaining . Also congratulations on the excellent report . Quick question - have they explained to you the difference between Long - Type 1 and Type 2? I might have missed it but can't find it anywhere on their site. "There are two levels (Haul Long Type 1 & Haul Long Type 2) of mileage requirements for all long-haul awards (except the oneworld Multi-Carrier Award). Haul Long Type 1 applies when the mileage distance of either inbound or outbound itinerary falls between 5001 and 7500 miles and none of its origin, destination or turnaround points include a city in the Americas. If a city in the Americas is just acting as a transfer point or en-route stopover (not an origin, destination or turnaround point), Haul Long Type 1 still applies. Haul Long Type 2 applies when the mileage distance of either inbound or outbound itinerary falls between 5001 and 7500 miles and the origin, destination or turnaround point includes any city in the Americas." I really don't see why they have both MPC and AM. it's just confusing. Merge them into one and keep things simple like other airlines. Thank you Stephen for doing such a comprehensive report. I was in the process of considering swapping my Qantas FF for Marco Polo as I am doing far more travel internationally on CX flights. Cathay make it so convenient flying internationally out of Adelaide! After reading this I will just have to ensure I get my required QF flights domestically. any word on taxes and surcharges??? Do we know what the points cost is for an Oz-Europe redemption ticket in J class? My most recent experience, syd-hkg-syd(J), was like chalk and cheese in comparison to my syd-ord-syd(J) and a syd-dxb-syd(J), both a few years ago, which were both superb to say the least. This last CX hop to hkg service was rushed...the bus to stairs boarding was like cattle herding. Business pax being pushed and past by economy pax - all mixed on the same bus to ac. Only one set of stairs to L1. CX staff just stood there and watched. Food was really poor, and service was rushed. Simple-never again flew CX. Perhaps Stephen Chow should become AusBT's Asia correspodent? Very detailed and helpful article. Nice one. Enjoy reading your review. Very informative. I hope you will pen down other reviews as well. I am CX Diamond and recived the grand announcement of the great and benficial changes coming our way . It was a bit like Donald Trump saying how wonderful the benefits of the new Tax plan would be to the working class ...i.e a load of Bull****! There has never ever been and never will be a revamp of rules that benefit the passenger ! This is just another devaluation of the MP program . Dont forget when they limited the number of redemption seats available, now they say they are increasing them ( btw who is checking the nos? the passenger cannot ) , well thanks for giving some back ...but charging us more ! I dont mind CX honestly admitting they are going to try and save money but to dress up mutton as lamb is disgraceful "fake news" ! Totally agree, what a smart way to cover up huh! I think this is the most stupid move of Asia Miles in revamping the miles as now marco polo members of higher tier such as the Gold member, will need higher points to redeem for the companion ticket as well as long routes, for eg, companion ticket to redeem from KL-HK-TOKYO under current system is now only 50,000, with the new system it has increased to 67,000, likewise for longer routes such as to Europe like Germany, it used to be only 75,000 and now you need 98,000!!! this is totally discouraging. Do you expect Gold member to redeem an economy ticket and downgrade themselves just to save a bit of the miles??? They are delighting the lower tier members at the expense of higher tier member, is this what the objective is all about on this revamp? the changes are now live - the new booking engine 'helpfully' selects more expensive options for you forcing you to opt-in to the lowest standard awards every time. I guess in retrospect the new system does provide more redemption seats at the high-end airmiles cost which of course suits the ultra regular corporate fliers with more air miles than they know what to do with ! It allows them more options to burn up those excess unwanted miles lying dormant in their MP accounts. Comment on "The winners and losers in Cathay Pacific's radical Asia Miles revamp"